Condoleezza Rice was born and raised in Birmingham, Alabama. She is an American diplomat and political scientist. Rice held the position of Secretary of State in The United States. This was under the administration of former President George W. Bush. She is the first African American women to hold this particular position. She was in office from 2005 to 2009 and was succeeded by Hilary Rodham Clinton. She was also given the position of Security Advisor of the U.S. during this term. Rice is the daughter of Angela Ray Rice, a music teacher and John Rice, Jr., a guidance counselor. She grew up in Alabama, which was at that time racially segregated. It was during her stay at the University of Denver when her interest in politics emerged. She attended a course which was taught by Professor Josef Korbel, a well known international political scientist This got her interested political issues. Until the year 1982, she was a democrat; later on she said that she was a republican. Rice was hired as the assistant professor in the field of political science at Stanford University during the 80’s. She specialized in study of the Soviet Union. During this time, Stanford and UC Berkeley created a joint program where she gave lectures on this subject. Rice was promoted as Provost of Stanford, right before she entered politics. She was said to be responsible for the management of the multi-billion dollar budget of the university. During this time, the school was short $20 million, and she promised to have this deficit balanced no later than two years. After two years, Stanford announced that this large deficit was eliminated and they were holding a surplus of over $15 million. After Bush’s administration, she then went back to Stanford University and continued her career specializing in political science. 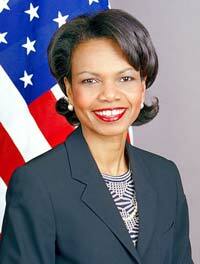 Rice was officially named the National Security Advisor on December 17th, 2000. She was given the nickname “warrior princess” because of her strong nerve as well as her delicate manners. Right after the 9/11 attack, Rice set forth to create a new outline on national security which included missile defense in order to take down threats of terrorism. Rice was nominated as Secretary Of State on November 16th, 2004 by President Bush. Her nomination was confirmed by a Senate vote of 85 – 13. The negative votes were from those who wanted to hold Rice and the rest of the presidential administration accountable for what happened during the 9/11 attacks. As the Secretary Of State, Rice championed the expansion of democracy in other countries. She believed that attacks on September 11th were the result of oppression and despair, therefore she believed that democratic reform to support the basic rights of those throughout all Middle East was essential. Her entire goal was something she called Transformational Diplomacy.